Before I even start writing the post, I have to mention that this is one of the very best bread that I have baked in my baking era. 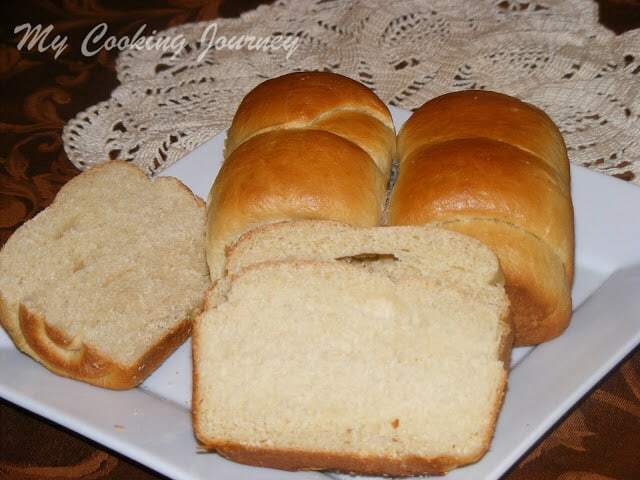 I have to thank Swathi of Zesty South Indian kitchen for choosing that bread as a challenge for this month. 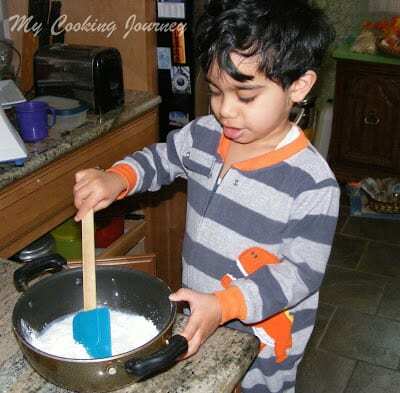 I am so glad that I joined this Baking group called the Baking partners, started by Swathi. Every month we are given a baking project to take up as a challenge and this month she had given us three different bread making techniques. I chose the Tangzhong method of making the bread. 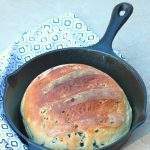 A little background and explanation of this method; Tangzhong or the water-roux method is one of the best bread making methods out there. 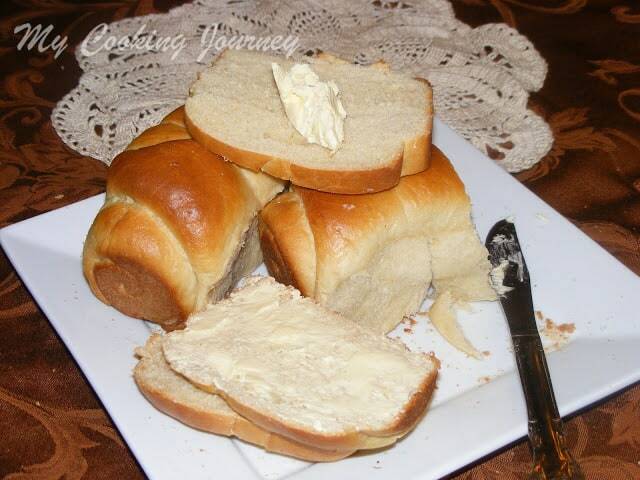 This method not only ensures the softest homemade bread but also retains the freshness of the bread much longer. The reason for this again lies in the water roux combination that we add to the rest of the ingredients when making the bread. Tangzhong is made with 1 part of flour to 5 parts of water or water/milk combination. This mixture is then cooked on low heat to make a roux. When the mixture thickens and forms a roux, it is cooled down to room temperature and this starter is used in the bread making process. Chinese use this procedure to make their steamed buns, dumplings and other breads. 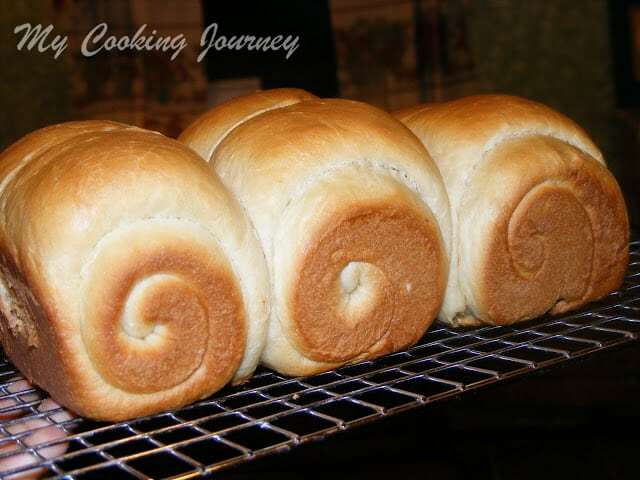 Then this technique slowly spread to other Asian countries and still remains one of the very popular methods of bread making in those countries. This recipe was adapted from Christine’s Recipes. 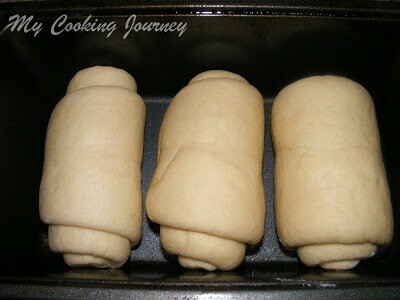 I have tried my best to explain it step by step as to how to make this bread. I have made plain wheat bread loaf from this recipe, but again once we learn the technique the possibilities are endless. 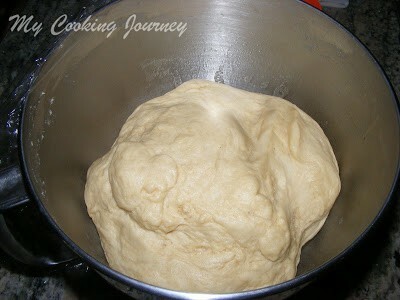 I can’t wait to try few other things from this bread dough and yes, they would be passed along to you as I make them. *Notes – if using active dry yeast instead of the instant yeast, make sure that you proof the yeast in warm milk before adding it to the flour. If using instant yeast, it can be added directly to the dry ingredients. 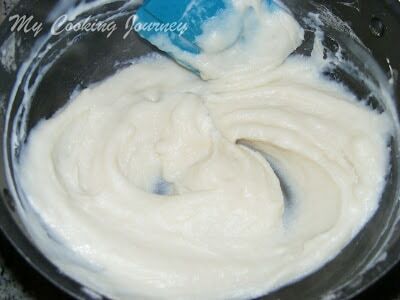 Mix the flour in water or water/milk combination without forming lumps. Cook this mixture on medium low heat stirring constantly with a spatula or a wooden spoon to prevent lumping or sticking to the bottom. Once the mixtures cooks it keeps becoming thicker and thicker and you can see lines forming when stirred. Once this happens the tangzhong is done. If you want to check the doneness by using the thermometer, the temperature has to reach 65 C/149 F.
Once the temperature is reached remove from heat and transfer it to a clean bowl and cover with a cling wrap. 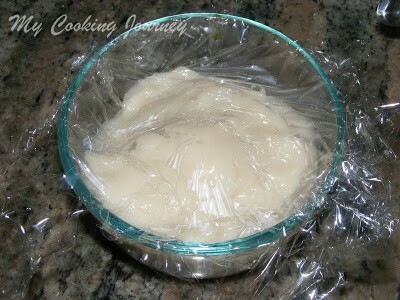 The cling wrap should be touching the tangzhong lightly to prevent any skin formation on top. Before using this in the bread making process, let it cool down to room temperature. Also the tangzhong can be stored in the refrigerator for 3-4 days or as long as it does not turn grey. The chilled tangzhong should be bought back to room temperature before using. Whisk all the dry ingredients (bread flour, wheat flour, sugar, salt, yeast) in the bowl of the stand mixer or the food processor. Add the milk, egg and the Tangzhong. Mix until they all come together and form dough. 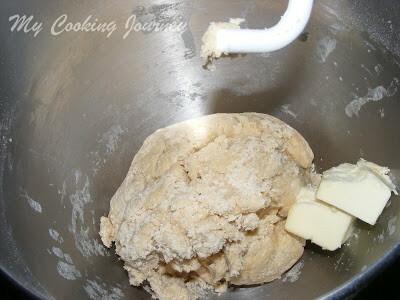 Now add the butter and continue to knead on medium high speed until the dough become smooth and elastic. This takes about 15 to 20 mins. To test of the dough has reached the right consistency I used the thin membrane technique. 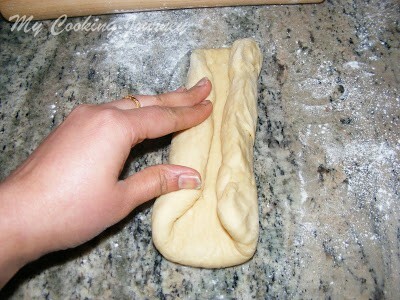 Take a small piece of dough in your hands and stretch it slowly on all 4 sides. If the dough forms a membrane without breaking apart, then you know that the dough has kneaded enough. 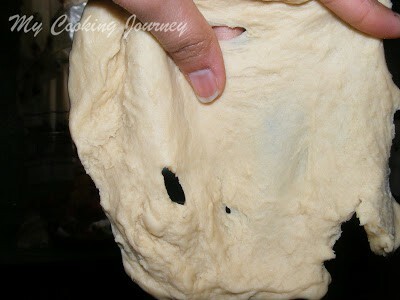 If the dough breaks into pieces when trying to stretch, knead it for few more minutes and try again. 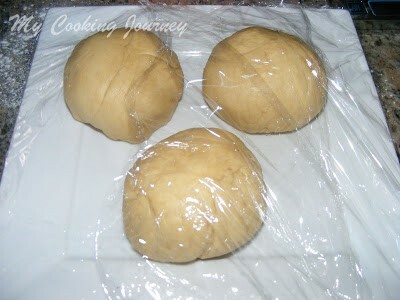 Placed the dough in a well oiled bowl and wrap it with plastic. Let it rise in a warm spot until doubled in volume. The original recipe said about 40 mins, but it took me about 1 ½ hrs to double in volume. 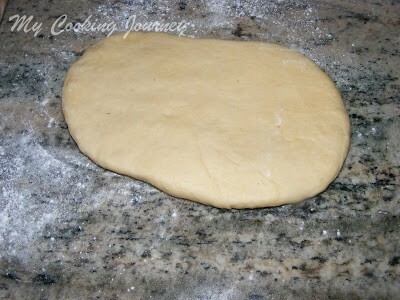 On a lightly floured surface deflate the dough and divide into 3 equal parts. Being in a fancy mood, I weighed my three parts and made sure they were of equal weight. Make balls out of the 3 parts and rest it again for about 15 minutes covered with plastic. 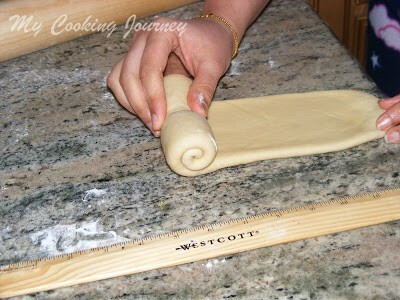 After resting (for the dough and you), roll each part into long oval. 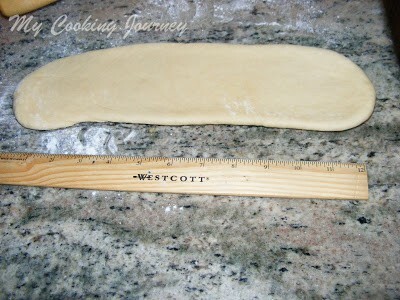 Now fold the dough vertically over each other and then flip the dough over with the seam side under. Now roll it again vertically into a long oval piece about 12 inches long. 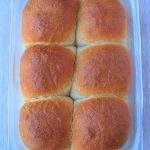 Starting from the end farthest from you start making a tight roll into a cylinder shape and place it in greased loaf pan seam side down. 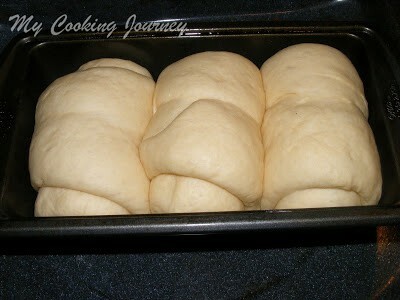 Repeat this step for the rest of the 2 balls of dough and place them nest to one another in the loaf pan. Leave this to proof for the second time, wrapped with plastic, until it rises 3/4th of the height of the pan. This took about 45 minutes for me. 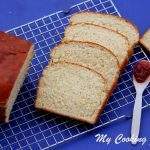 Brush the loaf with egg wash or milk and bake in a preheated 350 F oven for about 30 -40 mins. 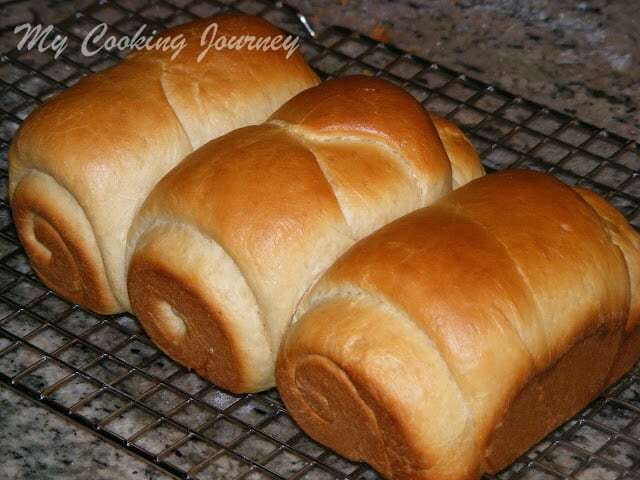 The top has to become nice golden brown and the bread would sound hollow when tapped. If the top browns too quickly, tent the pan with foil during the last few minutes of baking. Remove the loaf on a cooling rack and let it cool completely before slicing. All purpose flour could be substituted for bread flour. check to see if the yeast is instant or dry active and follow the instructions mentioned above in the notes. Always allow enough proofing time for the best airy bread. 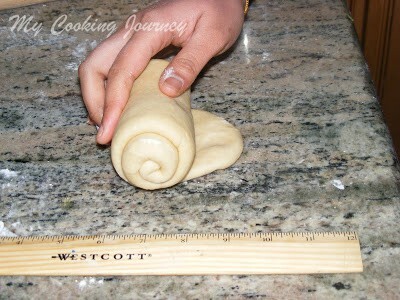 Roll the dough very very tight, otherwise the bread will have pockets in between that might open up when slicing. Let the bread cool down entirely before slicing it open. From experience, I know that if not cooled down enough the slices would end up looking shaggy and sad. They would still taste great, so I guess it is alright after all to be a little impatient. So beautifully done sandhya. Soft n fluffy. Super spongy and prefect looking fantastic bread, hugs to those lil hands for helping u.
i could not believe its made with whole wheat flour..
love your little helper , that makes bread even more yummier. cross the state and stop by too. 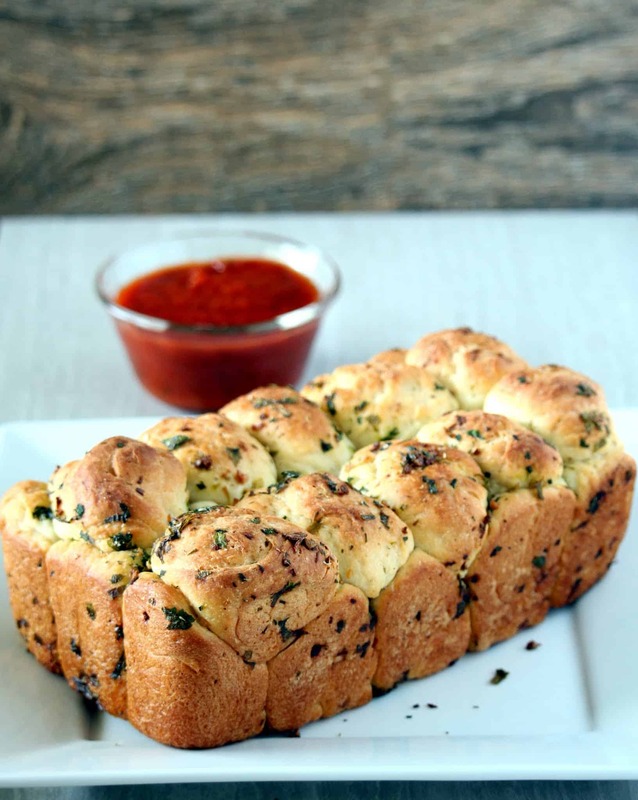 wow..the bread looks soft and delicious..Yummy,loved the crust!! 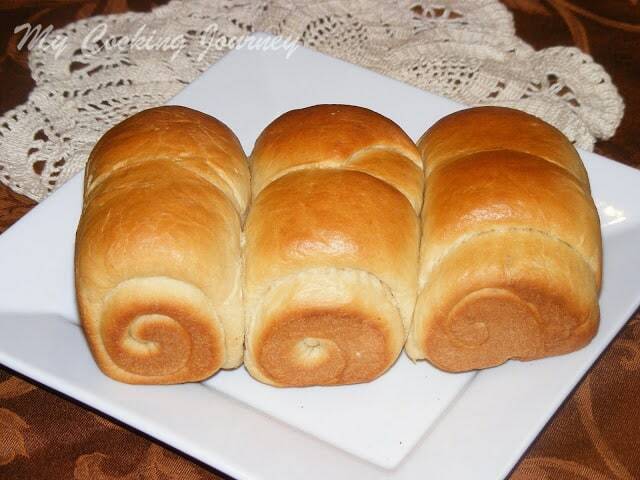 fantastic bread.so soft,loved the way u have rolled it. lovely dear nicely baked.Love the texture. 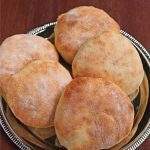 Nice and lovely soft bread. 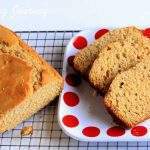 I used this method a few months ago for a recipe and the bread comes out so soft! – yours looks super delicious! 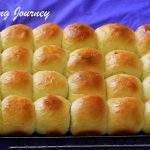 Soft and yummy bread,beautifully baked Sandhya. Sandhya you made beautiful bread, I love it you explained very well. Give my kisses to your Cute chef. So wow these look so delicious and I love the little chefs pic. he is so sweet. hope little one enjoyed, perfect soft bread. You have given the ingredients for 1 loaf. So need it be divided into 3 portions? I don't know whether I am missing anything? Jus love love love homemade bread. This looks so great. As I write I can smell it…wow my heart telling me make it make it soon:) Great to see ur kidoo helping out. So cute! 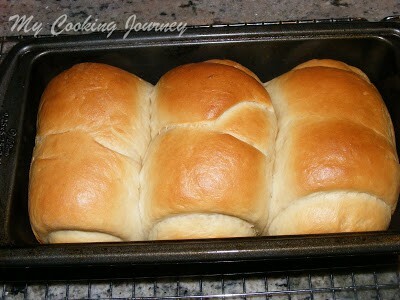 Love the pretty rise of your bread..looks extra soft and yummy!! Wow super love the spongy bread. Well made. 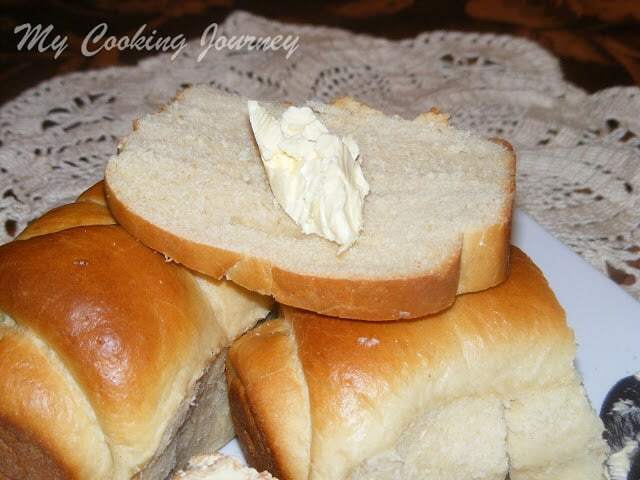 Soft bread.. Nice clicks too..
Love how perfect your bread came out! 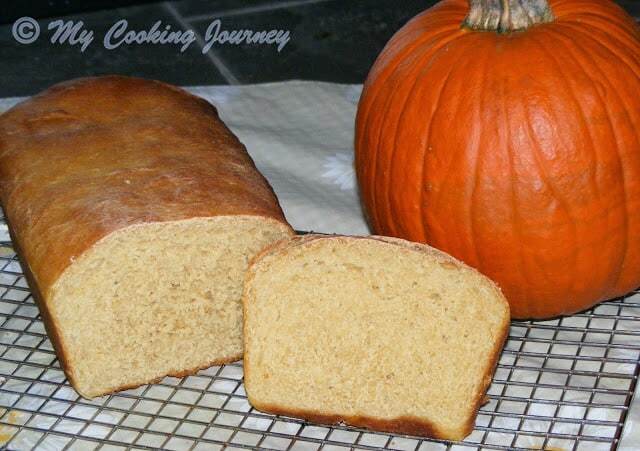 The golden brown color is so even and that makes the bread even more tempting!